Grooove BPB is a moderately stripped-down version of Grooove which is available on www.bedroomproducersblog.com. Take a look at the feature comparison chart to learn about the differences between Grooove BPB and Grooove. This maintenance update brings a couple of minor improvements. This is so sweet: SampleScience offers free drum kits for Grooove BPB, based on NES sounds from their drum sampler Famidrums. The Grooove BPB kits can certainly be used in Grooove, too. Grooove 1.3.21 for Mac released. In case you experience difficulties with downloading Grooove from our server directly, please use one of the download links below. Fixed: Sample Mix controls for Min and Max on the Sound Engine inspector are disabled under certain circumstances. Fixed: Some changes on the MIDI Settings inspector are not saved correctly under certain cicumstances. Grooove 1.3 released! The public beta period has been competed successfully. Windows and Mac OS X versions are on a par again. Grooove 1.3 PUBLIC BETA for Mac OS X released, addressing El Captian (Mac OS X 10.11) compatibility issues. The guys in London made an excellent tutorial video. More can be found in the magazine. Buy the new Computer Music and download Grooove CM right now. Grooove might crash host applications when being unloaded or when a project or the host is being closed. This has already been addressed. A fix will follow soon. 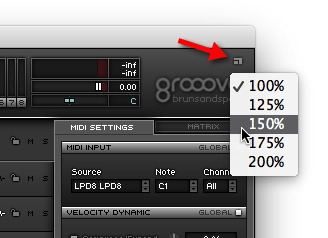 Grooove 1.1.1 for Mac OS X released. Multi output issue in AU version has been fixed. Fixed: Possible network error prevented activation on Windows. Hoooray! Grooove 1.0 has been released.